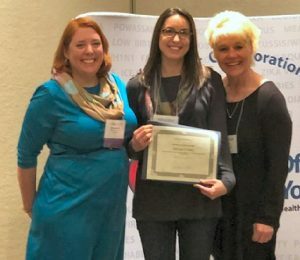 OSWEGO – The Oswego County Health Department was one of seven counties that were recognized by the New York State Department of Health Bureau of Immunizations at the 2019 Statewide Immunization Meeting held March 13 and 14 in Saratoga Springs, N.Y. The state Department of Health (NYSDOH) Bureau of Immunization recently recognized Oswego County’s health department for its collaboration with local healthcare partners to implement human papillomavirus (HPV) vaccination clinics on the SUNY Oswego campus. Pictured from left are Elizabeth Rausch-Phung, M.D., M.P.H., director of the NYSDOH Bureau of Immunization; Anna McNamara, RN, immunization coordinator for Oswego County; and Tina Bourgeois, senior LPN. Anna McNamara, RN, and Tina Bourgeois, LPN, were at hand to receive the Innovation Award, recognizing the health department for their collaboration with coalition members to implement human papillomavirus (HPV) vaccine clinics on the SUNY Oswego campus. Over several months, the Oswego County Immunization Program collaborated with Mary Hitchcock, RN, clinic nurse manager from Oswego County Opportunities and Angie Brown, MSN, FNP-BC, director of student health services at SUNY Oswego, to implement the program at the Mary Walker Health Center on campus. Older teens and young adults can still benefit from the HPV vaccine. The vaccine will protect them from the most common types of HPV. Young women can get the vaccine through age 26. Young men can get the vaccine through age 21, and for some, even up to age 26. For more information on HPV and the HPV vaccine, contact your healthcare provider or the Oswego County Health Department at 315-349-3547.